Kids of all ages love hanging by the pool. This summer show all the kids in your life a great time by hosting the perfect pool party. 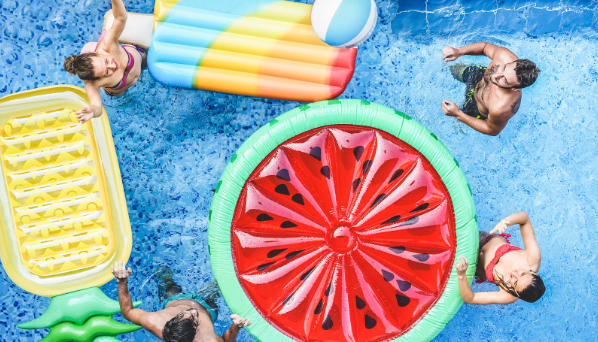 Hosting a pool party should be as fun for the host as it is for the guests. With that in mind, here’s a checklist to help you plan your next summer bash. Take the time to create something enticing for your friends and family to receive. Showing you care about the invitation shows you care about the party. It also will ensure that you give everyone consistent information as to time, place, theme and other details you may want to share. Even a few small decorations will add a sense of occasion to your next party. Table cloths, outdoors lights and seating are a few important things you should consider when planning your party. Nothing says party more than good music. Take some time to create a playlist that compliments your parties theme, but will also be enjoyable to your guests. Remember your not programming music for yourself, pick songs everyone will like. Ever go on a cruise ship or travel to a resort and notice all the towels? It’s like those places run on towels! When planning your party remember some people will bring their own towels, but their will always be a need for extras. Avoid having to run around later and prepare by setting out towels easily available to all your guest when preparing for your pool party. Your guests will spend more time and be more comfortable in your pool if you can provide floaties. That’s right, the classic pool noodle is all you need to keep you guests engages in the pool. Pool noodles can also add colour and style to your party as a functional decoration. Don’t forget to feed your friends. It isn’t a party without some refreshments and any real friend will be the first to let you know by leaving your party when as soon as they get peckish. Provide water, juice and other drinks and snacks, but also be safe and remember not to serve anything in glass. Simple treats like chips and fresh fruit can be all it takes to keep party goers happy. Earn extra bonus points and provide sunscreen and shaded areas for your guests. No one wants a vicious sunburn and having this on hand for your guests will show them you care about their fun and their health.